There are so many things I want to experience with Sierra RIGHT NOW even though she may not quite be old enough. Ice skating is one of those. 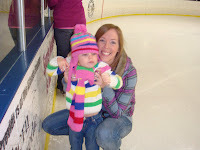 I have been wanting to take her but I wasn't sure if she would like the feel of the skates of her feet, if she would just flop down on the ice or just hate it all together. We braved it a few weeks ago, she and I and she LOVED IT! I was SHOCKED that she was excited about the boots. 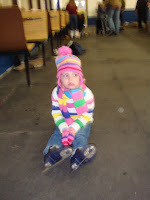 Sometimes she is tempramental about what she is wearing and I personally don't think skate boots are that comfortable but she thought they were so cool! (Disregard the blurriness of the photo) but here she is bored to tears as I take picture after picture. 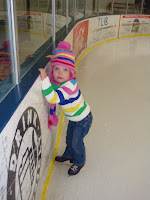 She's ready to get out on the ice.